When it comes to Seattle crime, there’s no comparing it to Sequim crime. The crime rate in Sequim is so low, and the Seattle crime rate is so high, it’s not a fair comparison. But if you live in California or Florida or New York, you wouldn’t necessarily know this, and you wouldn’t know how low our crime rate is in Sequim, Washington. The rural countryside, the Olympic Mountains, the Strait of Juan de Fuca, and the peaceful and safe community are all major reasons so many retirees fall in love with Sequim after doing their online research and visiting. 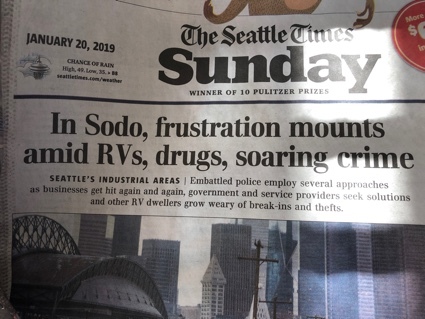 This is a recent Seattle Times Sunday newspaper, and the title openly admits Seattle neighborhoods, like this neighborhood, are suffering from extraordinarily high crime rates. Seattle is suffering now from four serious problems: 1.) high crime, 2.) out of control homeless who are causing serious crime, safety, and health issues (according to the Seattle newspapers, not me), 3.) ridiculous real estate prices, and 4.) some of the county’s worst traffic congestion. Obviously, the last two items are not crime issues, but the first two have been long stewing in Seattle as serious issues and have grown worse and worse over the past 20 years. As many of my readers probably know, Washington State is very liberal, mostly because Seattle is very liberal and that’s where the population resides. I’m not here to discuss politics. I have little faith in either political party, and discussing politics today with someone is like asking for a poke in the eye with a sharp stick. But the facts are that the Seattle politicians have failed Seattle because crime, the homeless problem, and traffic congestion are among the worst in the nation. Who else is there to blame if not the politicians who have been running Seattle for decades. I’m not advocating for any positions here, but I am saying that one plus one is always two, and what has happened in Seattle was predictable, was in fact predicted, and has actually happened on these three subjects. Seattle politicians took the idea of helping the homeless, but they got everything upside down. Instead of helping the homeless get help the way they needed it, such as training for a good job, or help getting off drugs, or getting mental health support, Seattle decided the best way to help the homeless was to give them free communities where they could set up tents and makeshift shelters. The crimes began to increase slowly at first. Assaults, rapes, murder, and illegal drug sales. And guess what? It was happening in these free communities adjacent to nice neighborhoods where half million dollar homes are owned by the very people who voted to offer all these free services to the homeless with zero accountability and no guidance to improving one’s life whatsoever. Now the people are disturbed because homeless people are urinating onto their front yards and dealing drugs in their neighborhoods and it’s not safe to go outside when it gets dark. Homeless from around the country began to hear about Seattle, and many began traveling to Seattle to settle into their new community where they could get a free place to live, free food, and clothes, too. Wait, because it gets better. Now the talk is to follow California and offer safe zones where homeless people can use drugs, shoot up, and even get clean needles from the ne’er-do-wells. I kid you not. They are talking about safe drug zones. Seattle crime has become a nightmare for residents. I talked with a couple who own a condominium downtown Seattle, and they said they are afraid to go outside at night. I realize this article may seem negative about Seattle crime rates, but what I really wanted to contrast was how Sequim crime fares in this world, and we fare very nicely, thank you. Believe it or not, people just don’t talk about getting their house broken into, or having something stolen out of their garage (even when they leave their garage door open), because these crimes are so rare. I’ve lived in Sequim for 24 years, and I have never had anything stolen, nor did my children when they were growing up, nor has anyone I know ever had anything stolen in Sequim, and I know hundreds of families. Cars don’t get broken into or stolen here either, or at least it is rare. We don’t have homeless people roaming the streets, and criminals don’t come to Sequim as a destination like they do in Seattle. So now you know about Seattle crime, the Seattle homeless problem, and the extraordinary low crime rates in Sequim. Just another reason so many retirees are moving to Sequim. One Response for "Seattle Crime v. Sequim Crime"
Fantastic web site. A lot of useful information here. I am sending it to some friends. And of course, thanks to your effort!